Jacob the Lolly Lover has given my family a yummie task: to taste and let the world know what we think of a range of lollies that he's given us - thanks Jacob! 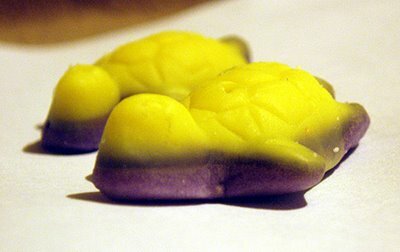 We start tonight with Yellow and Purple Turtle Lollies. Aimee: HHmmmmm. It tastes like marshmallow and grape bubblegum! Yummie. Bree: Top taste like marshmallow, bottom taste like gum. I like them! Mummy: Mummies face tells the story - they taste sour!. Not really her cup of tea, but she does think they are 'kind of cute'. Daddy: Quite bland really - chewwy and tasteless. Bland?!? No way. I think the turtles have more going for them than simply looking cute. On the other matter, thanks Jonathan. Good to know that other people also think i'm male. Very occasionally there are mistakes - innocent ones i'm sure. Like the time a Christams "Santa" (as opposed to one of the other ones!?!) in the old Deka on Queen St called me "little girl" from behind. Of course I was sporting a mullet at the time (Aimee - you can ask mum or dad what a Mullet is if you don't know) so it was obviously my own fault.